Lymphoma is a malignancy of the lymphatic system that is responsible for more than 21,000 fatalities yearly in the United States alone. According to the Centers for Disease Control and Prevention (CDC) estimates, approximately 75,000 new cases of lymphoma are detected annually. The DOHH2 human lymphoma cell line was isolated from the pleural effusion of a 60-year-old lymphoma male patient in 1990. DOHH2 is the BCL-2 overexpressing lymphoma cell line that is an excellent host for studying human lymphoma. A 2013 study by Souers et al. published in Nature Medicine investigated the therapeutic potential of ABT-199, a highly potent, orally bioavailable and BCL-2-selective inhibitor that blocks the growth of BCL-2-dependent tumors in vivo and does not cause thrombocytopenia. The study indicated that ABT-199 enhances the efficacy of clinically relevant chemotherapy and immunotherapy in the DoHH2 xenograft model and inhibits tumor growth, suggesting targeted pharmacological inhibition of BCL-2 could be a promising treatment approach for BCL-2-dependent hematological cancers. A 2000 Clinical Cancer Research study by Klasa et al. used DoHH2 as a xenograft model to look at oligonucleotide-targeting of Bcl-2 in B-cell lymphoma. The data demonstrated that combination treatment of mice with ASO, a Bcl-2 antisense oligonucleotide, and cyclophosphamide, a cytotoxic agent, was successful in eradication of lymphoma cells. This suggests that Bcl-2 targeting with cytotoxic agents may be beneficial for clinical use. Ackler et al. (2008) published a Molecular Cancer Therapeutics article studying the combination effects of rapamycin, a macrolide antibiotic and mTOR inhibitor, and ABT-263, a potent Bcl-2, -w, and –xL inhibitor, in a DoHH2 model. Results demonstrated cell cycle arrest, apoptosis, and tumor regression that were enhanced by the combination treatment. Finally, Delforoush et al. (2016) used the DoHH2 model to study the activity of melflufen (melphalan flufenamide ethyl ester/J1), a derivative of a classical alkylating agent, in lymphoma. The study concluded the higher efficacy of melflufen as compared to the classic melphalan with demonstrations of cell cycle arrest with minimal side effects in vivo and in vitro, thereby providing a favorable alternative to melphalan. The DOHH2 cell line (human lymphoma) is used to create the DOHH2 CDX (Cell Line Derived Xenograft) mouse model. 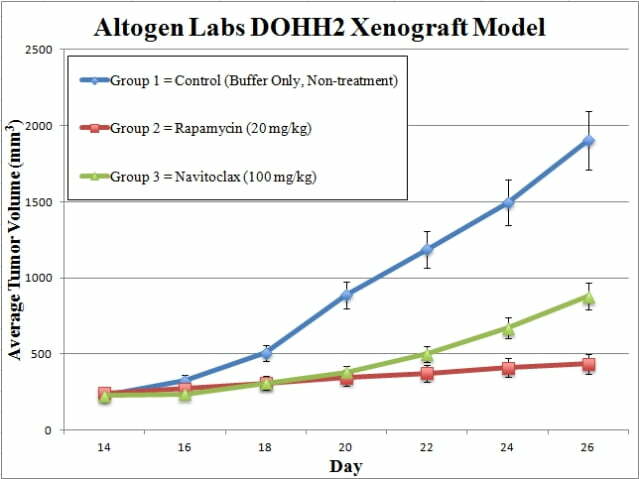 The DOHH2 xenograft model enables studies of tumor growth inhibition of a single therapeutic agent or as a combination (such as rituximab or bendamustine). Cells used for inoculation are maintained under aseptic conditions at exponential growth prior to injection. 2. As DOHH2 cells are prepared for injection, a viable cell count is determined with a trypan blue exclusion test (98% cell viability required). The cell suspension is then adjusted to the appropriate density for injection. 3. The mice (athymic BALB/C or NOD/SCID, 10-12 w.o.) receive a subcutaneous (s.c.) injection in the flank of the hind leg. A volume of 100 µL of Matrigel-DOHH2 cell suspension is injected (one million cells total). 4. All injection sites are palpated up to three times a week until tumors are established. The tumors are measured with digital calipers for an average size of 50-150 mm3. 5. Animals are then randomized into treatment cohorts according to the study plan. Administration of the compound of interest follows the predetermined treatment schedule. 6. Tumors are measured daily; mouse weights are recorded 3 times weekly. 7. Animals are euthanized as tumor size nears 2,000 mm3 or the predetermined size limit (per IACUC protocol). 8. Necropsy and tissue collections are performed as defined in the termination of experiment protocol. 9. Tumors are excised and weighed. Additionally, tumors can be documented by digital imaging. 10. If tissues are collected for downstream analysis, standard gross necropsies are performed. 11. Tissues and tumors are snap frozen in LN2, placed in RNAlater reagent or prepared for histology.